February is a month full of sugar, love, and all things pink and red! When I think of sweets the first thing that comes to mind is Red Velvet cake, followed closely by chocolate. So with Valentine’s Day quickly approaching what better way to show someone you love them than with a batch of Red Velvet Cupcakes frosted with a decadent White Chocolate Icing! I know you may be thinking that red velvet cake is traditionally topped with a cream cheese frosting, but let me just say that the white chocolate icing really pairs nicely with the red velvet cake and makes for an extra sweet Valentine treat! If you’ve been checking out all the latest cake decorating trends and are a frequent follower of The Cake Blog then you know that the ombre technique is pretty popular right now! After ooing and awwwing over ombre cakes for the past few months, I have been dying to use this technique! 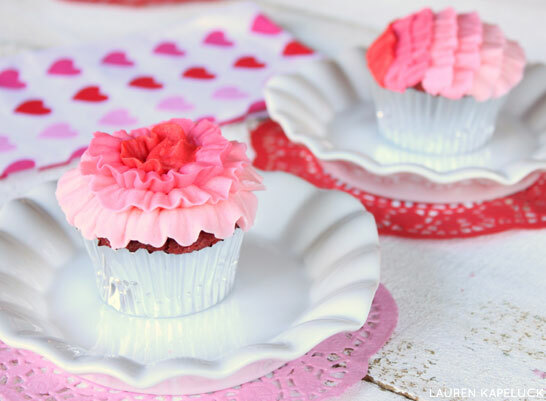 I couldn’t think of a time more perfect than the month of love to pull out the pink and red food coloring and give it my best try at decorating with gradients with these Ombre Ruffle Cupcakes! Although all these shades of pink and red may look a little intimidating when it comes to decorating, this method could not be any simpler. It just requires cleaning up a few extra bowls and spatulas after the decorating is done! But I say a little more mess was definitely worth it with these sweet cupcakes. I love the ruffled and frilly appearance of these cupcakes, it reminds me of lace and doilies. To recreate this look all you need are four Wilton #104 piping tips, piping bags and pink and red coloring which you can find at your local craft store. It seriously requires more effort to mix your shades of icing than it does to decorate the cupcakes! Just squeeze the piping bag and let the decorating tip do all the fancy work for you. You can pipe horizontal lines across the cupcake to create the ruffled look from light to dark. Or you can pipe around in a circle from the outside of the cupcake to the inside to create a layered flower. In medium bowl combine dry ingredients: flour, cocoa powder, baking soda and salt. In bowl of stand mixer combine sugar and vegetable oil and beat until combined. Add vanilla, vinegar and food coloring and mix well. Gradually add in flour mixture and buttermilk alternately, starting and ending with flour. Scrape down sides of bowl as necessary. Once cupcakes are completely cool frost with White Chocolate icing. In bowl of stand mixer beat butter until creamy. Heat chocolate in microwave safe bowl for 30 second intervals stirring in between until melted. Approximately 2 minutes. Gradually add in confectioner’s sugar one cup at a time, scraping down sides of bowl as necessary. Add heavy cream 1 Tbsp at a time as needed until reach desired consistency. Tint 3 bowls with Wilton Pink coloring, creating a pale, medium, and darker shade of pink. Tint 1 bowl with Wilton No Taste Red coloring. Place icing in piping bags fitted with tip 104. To create the ruffle look: Start with the lightest shade of pink. Hold the piping bag so the narrow part of the tip is facing towards you and gently squeeze in a slight back and forth motion as you go across the bottom of the cupcake to create a ruffle. Make 2 rows of ruffles using the lightest pink. Repeating the same technique, make two rows of ruffles using the medium pink, dark pink and red icing until your entire cupcake is covered. To create the flower: Start with the lightest shade of pink. 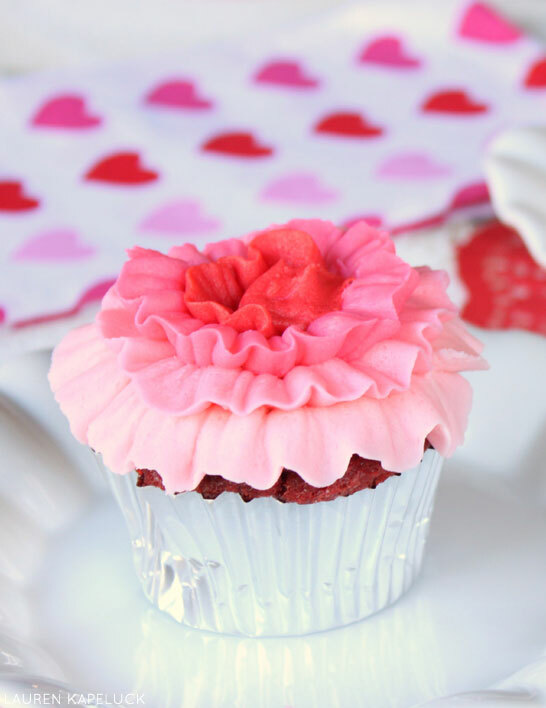 Hold the piping bag so the narrow part of the tip is facing the outside edge of your cupcake and gently squeeze the icing out of the bag in a ruffle pattern going in a circle while turning the base of the cupcake with your other hand. 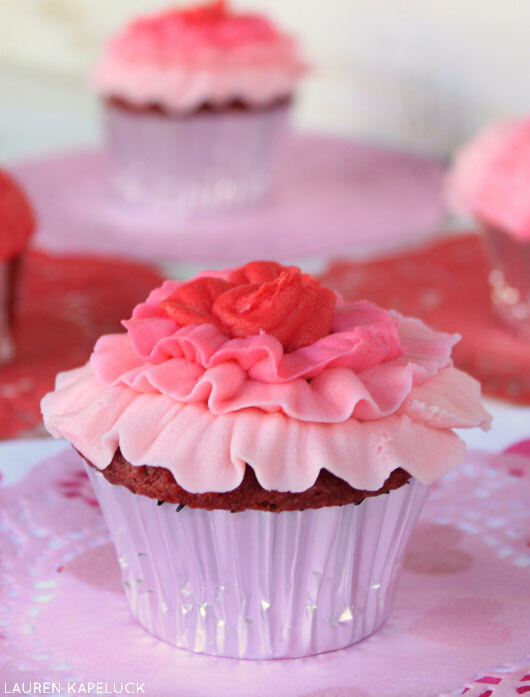 Repeat the same technique to create the inner ruffled circles of the flower with the medium pink, dark pink and red icing. Looks really great! I love ombre and your work is amazing! I love these!! I think I’ve just found the perfect treat for my family this Valentine’s Day! Thank you! Beautiful! Can’t wait to give these a try!! These cupcakes look amazing. I am such a sucker for pink so these are right up my alley. These are so pretty! What a great decorating idea, and the recipe sounds delicious. I can’t wait to try these out! Lovely! I’m not a cake decorator, but I love the new ruffle cake trend. It may encourage me to try my hand at decorating. These are gorgeous, almost too beautiful to eat. Ombre is such a gorgeous effect and coupled with the ruffles it is so effective here. Thanks for sharing. These are so very pretty!! I love the idea and I might actually be able to do this one… not as well as Lauren, but I’m going to try! Just saw these, and am so impressed. What a cute new technique! I want to express my appreciation for your kind-heartedness for folks that need guidance on the theme. Your personal commitment to getting the message all over came to be incredibly interesting and has usually empowered girls like me to arrive at their pursuits. Your insightful facts implies so much to me and far more to my colleagues. Thanks a lot; from each one of us. when do I add the chocolate into the recipe? In step 3 I melt it, do I add it in after I melt it? Or do you go to step 4, add the sugar into the creamed butter then add in the chocolate? Just came across these searching for baby girl baby shower ideas and love these! So delicate, fancy and feminine! I just applied your blog site to be able to my blogroll, I wish you would give some thought to going through the same.